The Lunar Group will bring to you The Stage, hosted by Freddie B, will showcase eleven emcees coming from all over New York and New Jersey. After the performances are over the after party kicks off with music by DJ Showtime. This is a FREE event, all you have to do is RSVP. Trippy Treats will be in the building to provide edibles. Thee Nine Three will have Black Collectors Item “20 year theory” t-shirts and long-sleeves for sale, the first 20 customers will get a free demo tape. Check out Thee Nine Three at TheeNineThree.com. 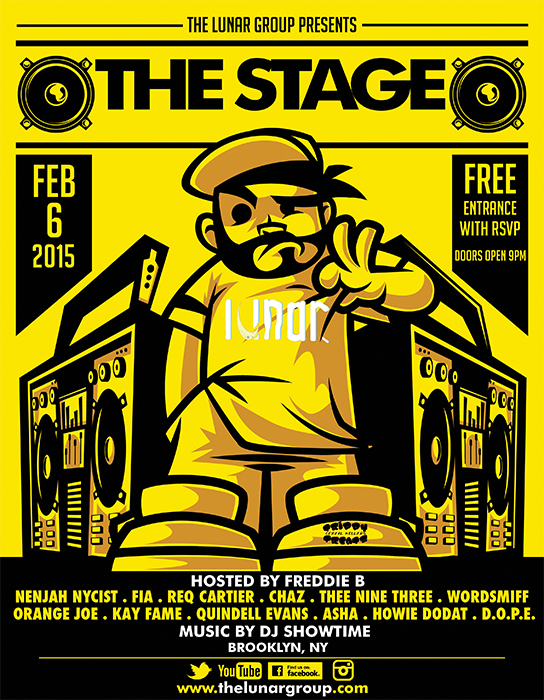 Tags: emcees, Free NYC, Music, party. Bookmark the permalink.